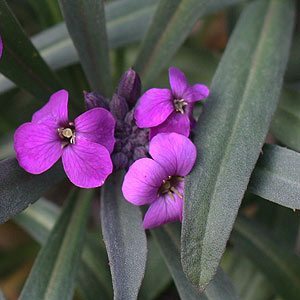 Some of the best and most reliable plants for spring flowers are the Wallflowers or Erysimum species and cultivars, they are long flowering, colourful and fragrant, not a bad wrap. They come on colours from white through to deep red and make great cut flowers as well. Wallflowers will flower from spring right through summer into autumn. They get the name from the original growth habit, they were often found growing on stone walls and rock faces. Traditionally they were picked and carried as posies to festivals and fairs. Wallflowers used to go under the name or Cherianthus, so you will find them sold as this in some nurseries. They are a varied group from low growing to tall and flower colour is also varied. In Australia we treat wallflowers as a perennial, rather than an annual as is the case in colder climates. They grow best in areas with cool winters and warm summers, and are not a big fan of humidity. Try sowing seed in coir pots and planting the whole pot. A mass planting of 20 – 30 plants looks great. They can get a little ‘raggedy’ after a year or two, just replace them. To keep Wallflowers flowering, prune them back after each flush of flowers. At the same time apply some all purpose slow release fertiliser. 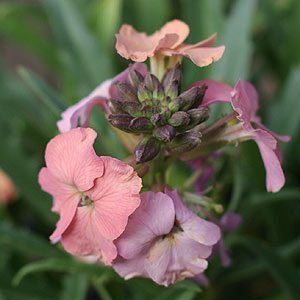 This will depend on the variety, most of the wallflowers we see are sterile cultivars, they will not produce viable seed and can only be propagated from cuttings. The method that we suggest is to take a cutting with a heel and use this. Best to remove and flowers or buds. We use a rooting hormone, although some gardeners use honey. The cuttings need to be formed into a free draining propagating mix and preferably placed into a cold frame. Try do to over water as this will cause the cuttings to rot, on the other hand do not lett hem dry out. Seed is readily available and, can be sown in winter into a greenhouse or cold frame, plant them out in early spring and treat them as a perennial in most of Australia. You can get seeds of the species, and some cultivars will self seed.